You know, I wish I could say I was a "fruit person," but I'm not. I like the basic things like strawberries, bananas and sometimes apples, but forget anything in the melon family, write off blueberries and, you know, I'm not even sure what a pluot is. And it's a bit frustrating sometimes, especially in the summer, when fruit it at its prime. I see people pluck a fresh piece and pop it into their mouths, and it's like they've reached seventh heaven, when all I can think is, "Ew." Rest assured, I have had no traumatic experience with the more exotic fruits, such as a run-by-fruiting (thank you, Mrs. Doubtfire); it's just how my taste buds and my palate have formed, I guess. But it's been extra challenging ever since we found a great source for our produce. It's called Community Helpings Coop, and every two weeks we get an Ikea bag full of 50% vegetables and 50% fruit. The first half I have no problem finding ways to use it, but the second half, well, let's just say this past week I had to have my mom show me how to prepare a cantaloupe. This week we got a small bushel of plums, and the fact that neither of us seemed very excited about them let me know right away that these would be the ingredient of choice for this week's Thrifted Kitchen. So I started thumbing through my vintage cookbooks, looking for ideas that didn't involve canning them or just macerating them in sugar and dumping some ice cream or whipped cream on top. After that, I found mostly recipes for some sort of crumble, until I opened the Good Housekeeping Cook Book from 1957 and found a recipe called Dutch Plum Cake. I scanned through the ingredients, which seemed pretty standard, and then through the directions, which were interesting. 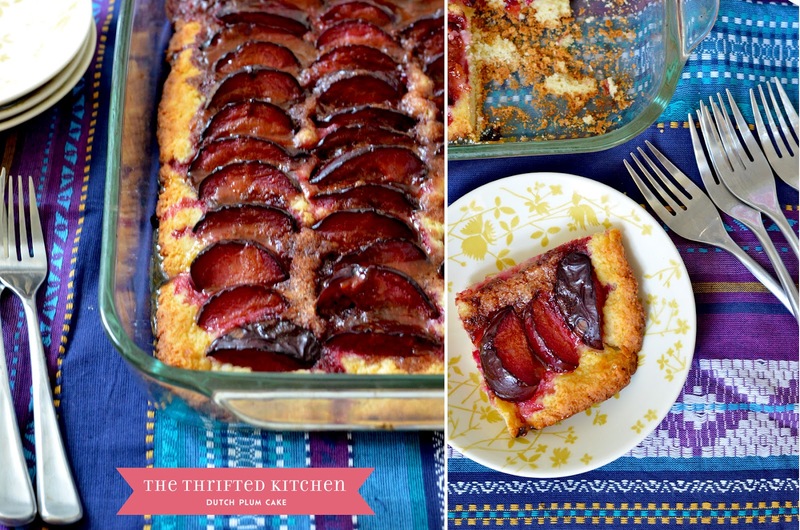 Instead of incorporating the fruit into the batter and baking it, you make a simple dough (which seems like it won't press out into an 8x12 pan, but it does), then top it with slice plums and a sugar/spices/butter mixture. Then, once it's done, you brush it with a hot water/apricot jam syrup. So simple...so quick to put together, and it turned out really delicious, still keeping the freshness of this seasonal fruit. And the color...plums are gorgeous once you pry them open, and seeming them all lined up in a row gives the cake this beautiful rustic look that is so appealing to my senses. According to the book, you can substitute peaches and apples for the plums, or make a fruit medley with peaches, plums and some seedless grapes, covering each third with one of the fruits (I bet that would look really pretty, FYI). I do hope you give this one a try sometime this summer. You definitely won't regret it. Start heating oven to 400 degrees. Sift flour, baking powder, salt, 3 tablespoons sugar. With two knives scissor-fashion, or a pastry blender, cut in shortening until like coarse corn meal. With fork, stir in combined egg and milk. Spread dough in greased 12"x 8"x 2" baking dish. On top, arrange plums, slightly overlapping, in parallel rows, with pointed edges down. Sprinkle with combined cinnamon, nutmeg, 3 tablespoons sugar, butter. Bake 35 minutes, or until plums are tender. Beat jelly with enough hot water to make syrup; brush over fruit when it's done. Serve warm, cut into squares. What a great idea! I am going to make blueberry pies this weekend, but I never thought of using plums in a concoction like this. I have got to try this one! I got the same cookbook as a wedding gift in 1969. I have been making this cake ever since but I usually use apples. I haven't made it in several years but was looking for the recipe. 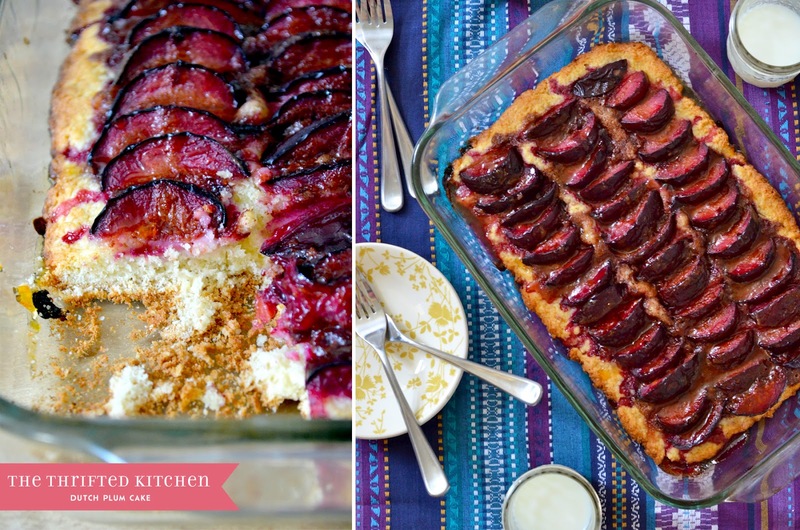 I searched on line and remember that it is called Dutch Plum cake and voila! There was the exact recipe from the same cookbook. I am looking forward to tasting it again!